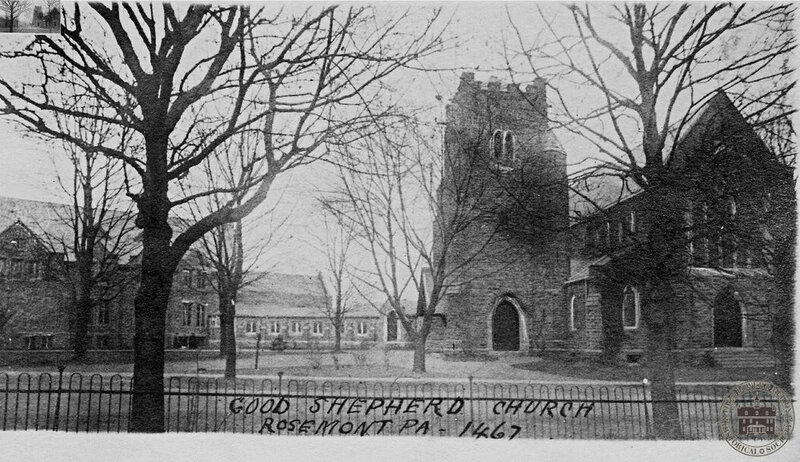 The Church of the Good Shepherd was founded in the summer of 1869 in Wayne, Pennsylvania. The Parish was incorporated and admitted to the Diocese of Pennsylvania shortly after. At first services were held in community halls and public school buildings as the search for a suitable location proceeded. In 1872 land was bought on the north side of Lancaster Turnpike in Villanova, and a church was built. The Church was from the beginning influenced by the Oxford Movement’s emphasis on the sacraments, holiness of life, and outreach and service to those less fortunate. Because of this, the Church of the Good Shepherd refused to employ the usual system of pew rentals for its financial support and, within a few years, founded the Home and Hospital of the Good Shepherd at a time when there was no other hospital on the Main Line. The Home and Hospital operated for fifty years. It took in children, both boys and girls, who needed extra care and attention and kept them until they were able to be on their own again. It was residential, and most of the children were not confined to their beds or even to the premises; they attended classes at the local public school less than a mile away. The Hospital was run by the Parish, but cooperation and involvement from other parishes were invited, as well as from the community at large. The generosity of many neighbors is recorded in the records of the Hospital. Meanwhile, in 1892 an offer was made by Mr. Harry Banks French, president of the pharmaceutical company Smith, Kline, & French, to build the parish a new church building, closer to the center of population, in Rosemont. The new church was to be a memorial to Mr. French’s recently deceased young wife, Augusta Graham French. Mr. French’s offer was accepted, land was bought, and construction began. The cornerstone of the building was laid on 17 June 1893; the building was completed, and the first service was held, on 27 May 1894. When the old Church building was finally taken down, the materials saved were used to build the present Parish House. This building perpetuates the dedication of the original church building to Bishops Bowman and Kemper, both of whom were active in the missionary outreach of the Church in the middle of the nineteenth century after the Civil War. After the Home and Hospital was closed, the Parish turned its attention to foreign missions. The Rev’d Edmund Souder was the Parish’s missionary in China from 1914 to 1938, and when he left the mission field he was succeeded by the Rev’d Leopold Damrosch, missionary in the Philippines from 1938 to 1951. The National Church then decided that individual parishes should no longer support missionaries in the field but instead contribute to the National Missionary effort. The Church of the Good Shepherd belongs in the Anglo-Catholic tradition of worship, teaching, mission, and has remained steadfast in Christian orthodoxy since its founding. Two basic pillars of parish life have been Catholic worship and Christian outreach. The unofficial motto of the Parish, adopted in the Centennial Year, is non ministrari, sed ministrare (”not to be ministered unto, but to minister”, Mark 10:45). ~ J. Bennet Hill, Jr.
For more information on the history of The Church of the Good Shepherd please see the publication entitled, "An Historical Sermon Delivered in the Memorial Church of the Good Shepherd, Rosemont, Pa. by the Rector The Rev. Arthur B. Conger A.M. On the Third Sunday after Trinity June 12th, 1910". The Rev. Arthur B. Conger was Rector of The Church of the Good Shepherd from 1883-1912.